Wabi-sabi of the Ivory Tower is one of my more recent works, finished in September 2017. The following text was written by Christophe Bonnet, in reply to the above painting. It’s quite a bit of text, but not a word too many. What is it, to be an individual ? Some people may find their way being as much as possible similar to others, doing lots of things the others usually do. Enjoying life according to ideas and pleasures widespread among crowds, in order to float and move on this stream, easily. Even very easily, if they have talent to that. Yes, that’s an option. But, do we really like it ? Or, are we “liked” by this kind of life ? Are we possessed by it ? Are we free ? Are we the kind of “God” we sometimes think we are ? When things that surround and support you are okay, you’re okay, you’re fine. But, when these things go wrong… how do you escape from their influence ? How do you cease to be a boat on the ocean ? More : how do you cease to be a drop of water in all this water ? You can’t really… You flow… you go where the water that surrounds you go. It’s possible you’ll never realize in your entire life that you are made and moved by your environment… and perhaps, chance can give you a good life… by chance. By pure chance. You’ll avoid the Niagara falls. Thinking, THAT is the point that starts to make you an individual. That is the liberty you are beginning to win for yourself on all that binds you to what you are not. And that you don’t want to be “you” anymore. So, your limits start to create, you see yourself in a more defined and realistic way. There is now a boundary with the outside world. And when we tell boundary, we tell the need to defend it (you don’t want to be overrun anymore by water all around you, don’t you ?) And that requires an organization to sustain the walls of your… mmm, let’s tell the walls of the “tower” of your new liberty. This intern organization, who will build it, if not you ? The model doesn’t exist outside (you have decided not to be anymore like the outside world). So, creating it, you act as totally free, nobody tells you what to do, you are not influenced, and you have to find a way that is of a kind of an immortal truth, on how to make things well and solid. You are alone, and you’ll create something necessarily pretty simple (because you start with zero, or much less, compared to all that the outside world can contain…) and pretty pure (as can the divine laws of the universe be). Thus, the tower you’ll erect will have a kind of great nobility… mixing the simplicity (the few things) you put in its construction, and the divine laws with which you arrange that simplicity. You’ll even can legitimately think your tower is an Ivory one, beautiful ; and look around as if you really were a kind of a God, or of a Goddess, raising your long and ivory neck above the world. Yes, you’ll be the tower you’ll had built. Sure, that’s a hard job to all these efforts, and to be such alone. You’ll suffer too. You’ll have to face the storms. Your tower will be continuously subject to erosion, which is inevitably entangled with the process of building. And you know time will overcome and defeat all you can do in this life (and let standing for some years after you – even hundreds or thousands of them, like ivory towers). There will be cracks too in your tower…But if you didn’t want cracks, you could have remained a drop of water in the middle of billions of others, and your life would have been much smoother with chance.. that’s a choice ! But cracks are lightnings : it is by them that human beings can link themselves with the idea of God. If you never know, in your life, that cracks exist, you think you and your life are perfect… and one day you go directly through the Niagara falls, no matter all seemed perfect for you, just before. You’ll give the direction. Which is : towards the sky, in sum. By the way, looking at the painting, we can’t deny that a direction is indicated… That’s not “full speed ahead”, but “full speed above”. A symbol of the communication between the sky and the human beings. That one only of them can create, in his corner, sometimes (sure, there are many solitary creators on Earth, not only one). Because, yes, it is creation. It is creation that give us the direction to become free. One has made the path before us, and he shows us. One of the ruses of creation, to make us come to it, is that creation is beautiful. And if we have the minimum crack on us to let us see creation, we can approach it, and thus approach our liberty. Only look at this painting. Sure everybody can find cues by which he personally sees the beauty. But for instance : to me (in addition to which I’ve already said), I can see the mountains that surround the tower, as petals of a rose surrounding a stamen or a pistil… And if the ruse of the rose is to call the bees with the beauty of its corolla, to give food and free life forever to bees, the ruse of the painting of an artist is to call the observer by similar beauty, to give him a kind of a food, and, moreover, his liberty. The nectar of his liberty. Who would search, then, for anything else than liberty ? When you’re a drop of water, you only can taste… well, another drops of water near you. Just think you can have honey. 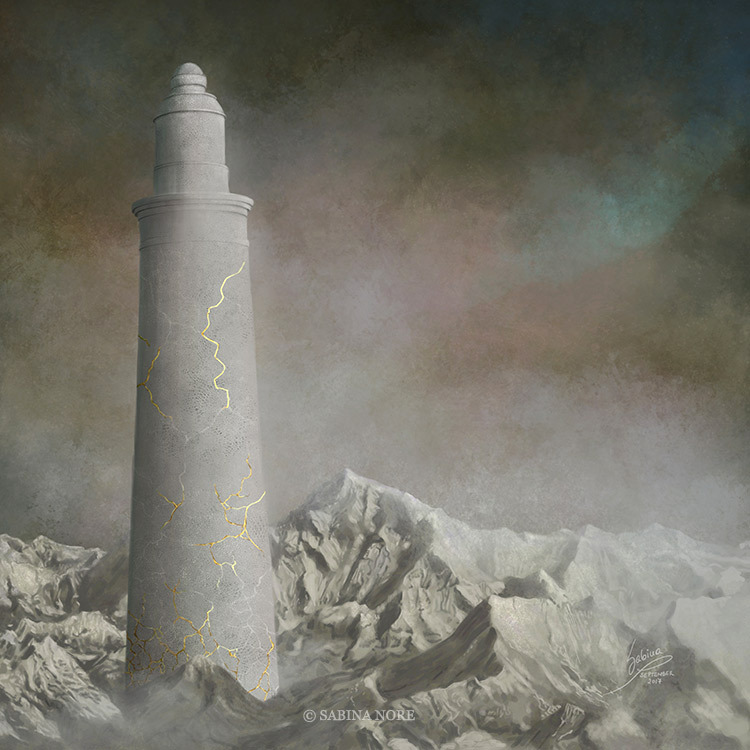 Wabi Sabi of the Ivory Tower is available as a 80 x 80 cm (~31.5″ x 31.5″) fine art giclée on stretched canvas. It is a high quality, museum-grade print, hand-signed by the artist.